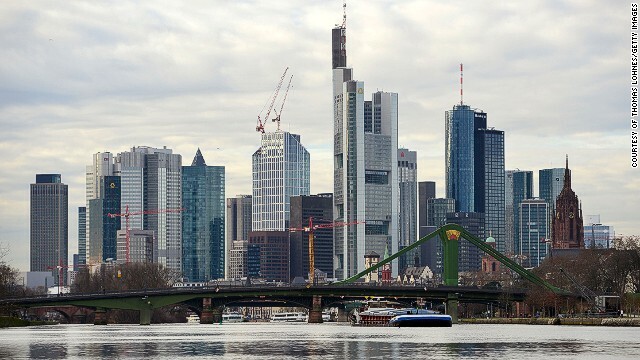 The skyline of Frankfurt, Germany's financial district is a bustling center of growth. As the world's fourth largest economy and with the second lowest unemployment rate in the EU, Germany is undoubtedly holding its own. If you're after great cheese, Germany has it sorted. 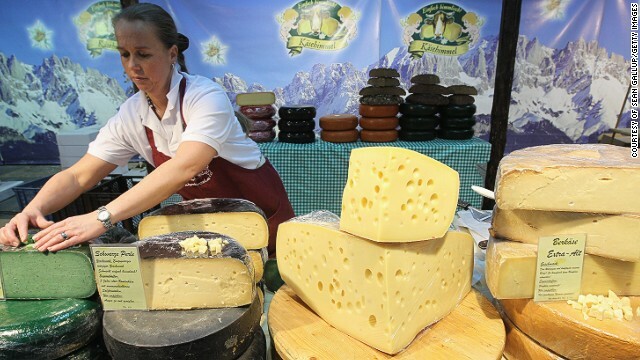 With over 400 varieties, Germany currently produces more cheese than any other country in Europe. An Emmentaler cheese stand is pictured at the Gruene Woche international agricultural trade fair at Messe Berlin. Who doesn't love chocolate? As the mastermind behind Kinder, Milka, Alpia and Ritter Sport, Germany is spoilt for choice. 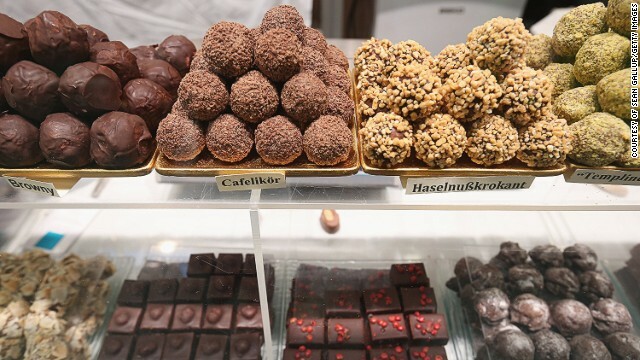 Chocolate truffles made from organic products, pictured, are displayed at the 2013 Gruene Woche agricultural trade fair in Berlin. It's safe to say that Germany has perfected the art of discount shopping. 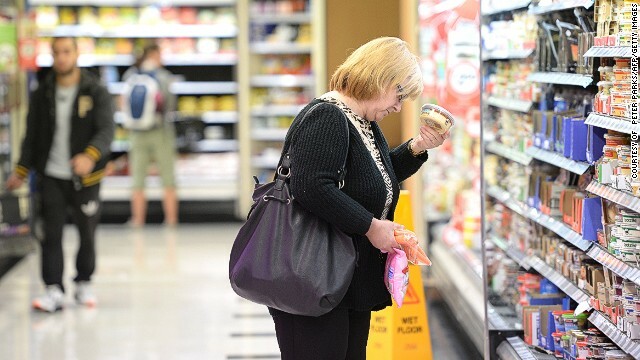 Global discount supermarket chain Aldi has 9,000 stores across 18 countries while Lidl has 10,000 stores across Europe. 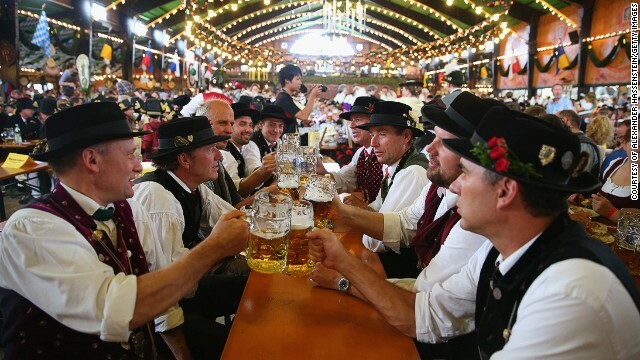 112 oxen, 48 calves and 6.4 million liters of beer were devoured at Oktoberfest this year. As the world's largest annual fair in Europe, a massive 6.3 million visitors traveled from across the world to attend the festival. Germany is known for its global presence in the realm of business. 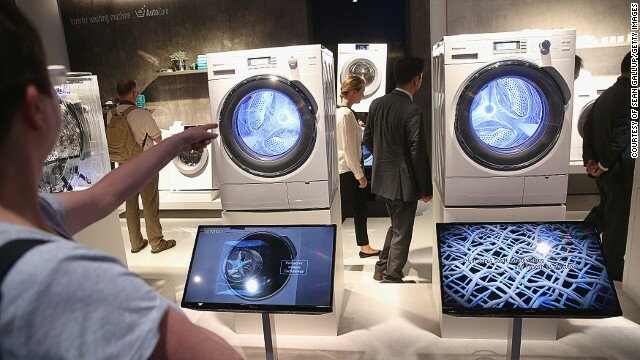 Companies such as Siemens, Bosch, BMW and Mercedes have grown into powerful corporations with a stronghold on the electronic and automobile industries. Siemens, the German engineering and electronics company, has its headquarters in Berlin and also happens to be Europe's largest engineering company. 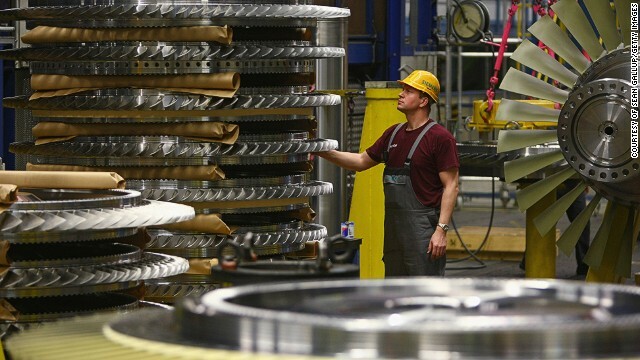 A worker, pictured, stands among rotor assemblies at the Siemens gas turbine factory in Berlin. Based in Wolfsburg, Volkswagen is Germany's leading automaker and the world's second largest car maker, producing 5 million cars worldwide in 2011 alone. The country's unique apprenticeship scheme has played a key role in nurturing Germany's manufacturing success, with school leavers spending around 2-3 years training with companies. A trainee, pictured, files a piece of metal at a Siemens training center in Berlin. 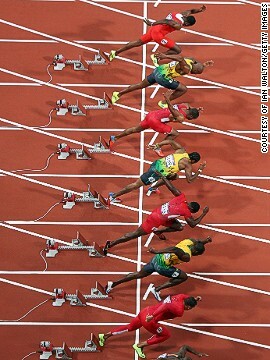 World famous sports brands such as Puma, Reebok and Adidas also have their origins in Germany. 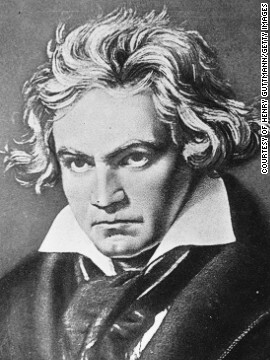 Classical composer Beethoven (1770 - 1827), generally considered to be one of the greatest composers in the Western tradition, was born in Germany. Editor's note: To mark the 25th anniversary of the fall of the Berlin Wall, CNN's week-long special Made in Germany will look at how the country's economy has developed since the momentous event. (CNN) -- Not so long ago, Germany was vilified for its slow economic growth, high unemployment rates, and record budget deficits. As late as 2004, The Economist called it the "sick man of Europe." Today, Germany is the world's fourth largest economy, and the most important market in the European Union. Its 5.3% unemployment rate is the second lowest in the EU. Germany exports more merchandise than any other country aside from China, and its share of total world trade is larger than that of the U.S. Not bad for a nation of 81 million citizens that's not even among the world's 15 most populated worldwide. The roots of Germany's 21st century economic success date back to the Industrial Revolution, when Germans were early adopters of rail transportation and coal production. But the country's current rise to status of economic superstar began on a cold autumn day, exactly 25 years ago. On November 9, 1989, a group of excited Berliners used mauls, chisels, hammers and fists to smash down the wall that divided the West and East part of the city. The fall of the Berlin Wall was a landmark moment, which intensified a process that fully materialized two years later with the collapse of the Soviet Union. What West Germans found when they entered East Germany was a society marked by high unemployment rate, low productivity and a lot of poverty. They also found a highly skilled workforce that was comparatively cheap, and new markets with an appetite for products. They found opportunities -- not only in the eastern part of their reunified nation, but also in many other former Soviet-bloc countries, like the Czech Republic, Romania and Slovakia. "Part of the success story of the German multinationals was their capacity to use the opportunities that arose -- first with reunification, and secondly with the expansion of the EU," said Fredrik Erixon, director of the European Centre for International Political Economy, a Brussels-based think tank. "German companies became increasingly skilled at understanding foreign markets and leaning towards foreign markets. Germany has done that in a way which I'd say is more efficient than what you see in the United Kingdom or France, which are the other two big economies that traditionally have had an outward-oriented vision." By the end of the 1990s, businesses from Germany played key roles in countries transitioning to a market economy, according to Erixon. German manufacturers were outsourcing parts of their supply chain to Eastern Europe, and German financial firms provided services to millions of people who were just discovering capitalism. 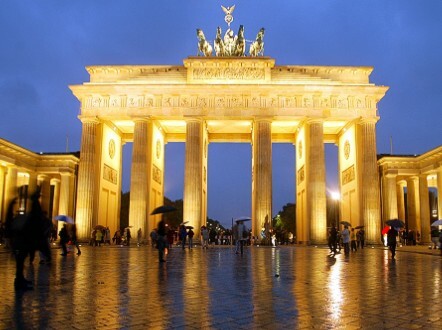 Berlin's famous Brandenberg Gate, which has witnessed the city's many transformations. It didn't end on the eastern edge of Europe. Germany turned into one of the world's largest exporters by going even further east to the emerging Asian markets, especially China and India, according to Irwin Collier, professor of economics at Free University Berlin. "You have these two huge blocks, huge economies that were starving for investment goods and it just so happens that is where Germany had its comparative advantage -- in the production of investment goods," Collier said. "The high Chinese growth rates meant there was enormous demand for German goods." The goods Collier referred to are mainly vehicles, machinery, pharmaceuticals and electronics. German car manufacturers like BMW, Mercedes and Volkswagen established a particularly strong presence in the Chinese market. Companies like Siemens, BASF (chemicals), Deutsche Bank (one Europe's largest banks), and Allianz (insurance) also became leading global corporations. In addition, thousands of medium-sized companies, often family owned, have been successful internationally and particularly in Asia, according to Anke Hassel, professor of public policy at the Hertie School of Governance in Berlin. Hassel said one of the keys to Germany's manufacturing success is the country's unique apprenticeship scheme, in which school leavers spend two to three years training with companies. "The apprenticeship scheme is very important in particular for manufacturing companies because they train people at mid-level skills in a very specific way," said Hassel. "They give them industry and firm-specific skills." Hassel explained that having relatively highly-skilled workers allows companies to be more flexible with their production process, and continuously improve. But it's not all rosy. According to Hassel, Germany's dependence on exports make it very vulnerable. During the 2008-09 financial crisis, the loss of Gross Domestic Product (GDP) Germany experienced was large compare to other countries, and even today fluctuations in the world economy are immediately felt in the German economy. And fluctuations will always happen. Currently, as market demand in China and other emerging markets is slowing down, Germany's challenge is to rebalance its economy away from an enormously heavy dependence on exports. It needs to increase domestic consumption, which has been relatively weak for decades, otherwise the economic growth it has experienced will not be sustained. In the quarter of a century that has passed since the Berliners tore down that wall, Germany has, no doubt, become an economic superpower. But as Germans know better than anyone, economic realities can change very quickly. Siemens is developing technology that will allow trucks to drive almost emission free. Ottobock is a family-run German company, and a market leader for prosthetic limbs which employs over 8,000 people. An innovation hub in the east of Germany is trying to revolutionize the role of humans in manufacturing. CNN visits Glashütte, the birthplace of German luxury watchmaking, to find out how the industry has regenerated since the fall of the Berlin Wall. A new, luxurious breed of eco-friendly cars is emerging, with Germany leading the way with Porsche Spyder 918, costing $1 million. Want a college degree for free? The last German federal state to still charge tuition fees has announced it's scrapping them, making studying in Germany 100% free. Not so long ago, Germany was vilified for its slow economic growth and high unemployment rates. Today, it is the world's fourth largest economy. CNN looks at how Germany reinvented itself after the fall of the Berlin Wall. All you need to know about Berlin Wall, seen as a symbol of the Cold War, and the surprising locations where you can find it now. 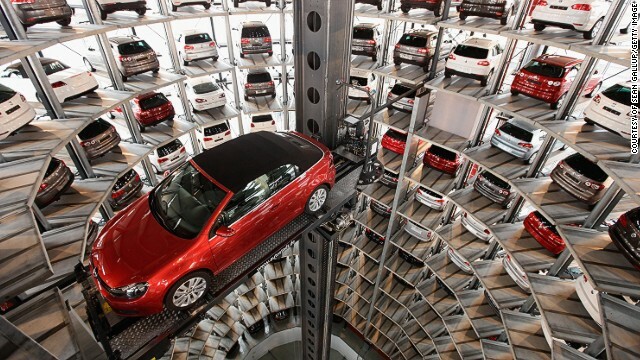 From priceless BMWs and Audis, to luxurious Porsches, CNN goes on a tour of Germany's world-class automotive museums. Meet Franciscan nun Sister Doris, one of only a handful of women working in Bavaria's beer industry.